I don’t think I have ever posted my full skincare routine, so I thought now would be a great time to share it with you! I want to point out now that I don’t use any ‘high end’ skincare products, only drugstore brands. I’ve not yet felt the need to really branch out and pay a lot of money for skincare, I’ll wait until I’m a bit older for that, haha. So first of all, make up remover/cleansing water. 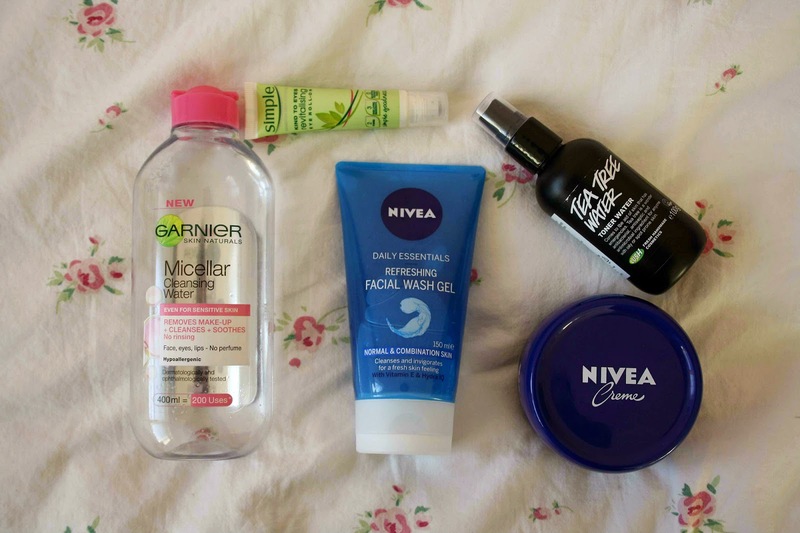 I use the Garnier Micellar Cleansing Water; which I’m sure everybody will have seen featured on blogs for a very long time now. I’m on my second bottle of this stuff, and I must have been using it for over six months now. It lasts a long time, which I love. I also love how nicely it takes off my make up, even the toughest of eye make up. It doesn’t irritate my eyes or skin at all like make up wipes used to do, so all in all amazing. Secondly face wash/cleanser. 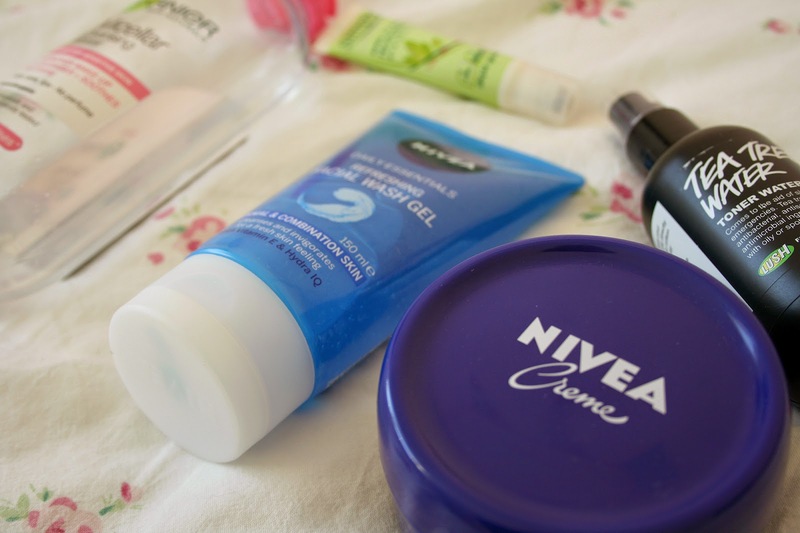 I’ve recently changed this, to the Nivea Refreshing Facial Wash Gel. So far so good with this product, its just like any other facial wash gel really. I have noticed that my skin feels super soft after using this however, which I find to be a big plus! After using facial wash I go onto toner. For this I use Lush Tea Tree Water. I don’t use this every day, just a few times a week. I sprits this all over my face and it helps with keeping spots away and things, which is what tea tree is known for. I think this really works and I love using it. After this I go in with my Simple Kind to Eyes Revitalising Eye Roll On. This is just an eye gel that you roll under your eyes to get rid of puffy and tired eyes. This has really helped to counteract my dark circles and feels very refreshing too. This has lasted me a very long time as well. Finally, moisturizer. I am DESPERATELY searching for a new lightweight moisturizer thats good for combination skin, if anyone has any recommendations please let me know! However, for now I’m using the Nivea Creme. I currently use this on the driest patches on my face as I don’t have a moisturizer suitable to put on my whole face. But I find this does a really good job at hydrating and making dry patches okay. What do you use in your skincare routine?